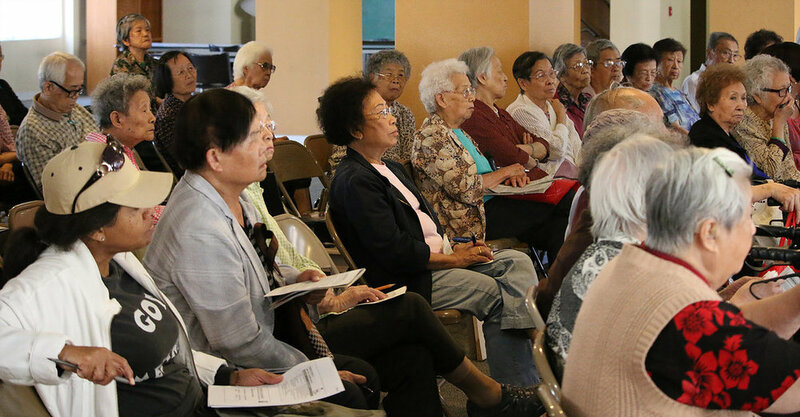 The workshop was geared towards primarily Chinese-speaking seniors looking for more easily accessible information about voter registration, ballot information, and general questions regarding the upcoming general elections. The workshop helped to inform over 100 senior citizens on various propositions that would be on their November ballot. The workshop also included an overview session about their polling location and how seniors could cast their ballots. Volunteers and staff were on site and provided much-needed help to those who wanted to register to vote. Voter registration and education materials provided by the California Secretary of State and Los Angeles County Registrar’s office were readily available. Many of the seniors at the workshop were interested in re-registering to vote as permanent vote-by-mail voters. Throughout the presentation, senior citizens actively discussed the ballot measures and were most interested in the initiatives affecting the use of plastic bags: Proposition 65 and Proposition 67. Attendees left the workshop more informed about the upcoming elections and were encouraged to make their votes count.